Upper Deck, known globally for delivering award winning sports and entertainment products, today announced that it is honoring the player represented on its very first sports card, Cincinnati Reds centerfielder Ken Griffey, Jr., with a trading card and framed photographs (*autographed and unsigned) honoring his historic inclusion into Major League Baseball's prestigious "500 Home Run Club." 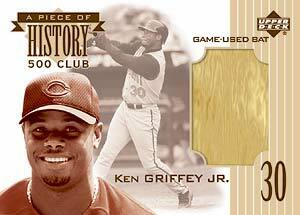 Griffey, known affectionately as "Junior" throughout his playing days, will have his "Piece of History 500 Club" card included in Upper Deck's "MLB Etchings" baseball trading card release available in late July at hobby stores nationwide. The Reds outfielder's name has been synonymous with the Upper Deck team since his rookie card was included in the 1989 set of Upper Deck baseball cards - he later became a spokesperson for the company in the 90's. The 1989 Ken Griffey, Jr. rookie card (No. 1) is widely regarded as the must-have card from Upper Deck and is recognized for vaulting the company to the forefront of the sports card industry. The latest card depicting Junior's achievement, the "Piece of History 500 Club" card, will contain a piece of one of his actual game-used bats and will show him swinging for the fences with his familiar left-handed swing. Additionally, Upper Deck Authenticated has carefully chosen and created beautifully framed photographs (*autographed and unsigned versions), as well as signed memorabilia - including jerseys, bats, and baseballs stamped with the commemorative 500 Home Run logo and patches - to capture this once-in-a-lifetime achievement of one of MLB's members of its All-Century team. For more information on ordering Upper Deck's baseball cards or these one-of-a-kind framed keepsakes, please visit www.upperdeckstore.com. In addition, Upper Deck and Junior recently completed a 30-second television ad for Power Up! Baseball that takes place inside the Reds dugout at The Great American Ballpark in Cincinnati. The ad features youngsters trying to match wits with the Reds outfielder and get the best of him while trading baseball cards to build their sets. The television commercial began airing the week of May 18 for four weeks in markets around the country. Upper Deck will also feature the slugger in a print ad honoring his achievement and publicizing his historic baseball card in an upcoming issue of the Cincinnati Times. *Autographed items will be available beginning in three weeks.